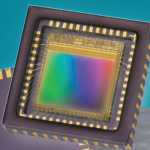 The EV76C570 is a 2 million pixels CMOS image sensor designed with e2v's proprietary Eye-On-Si CMOS imaging technology. It is ideal for many different types of application where superior performance is required. The innovative pixel design offers excellent performance in low-light conditions with an electronic global (true snapshot) shutter, and offers a high-readout speed at 60 fps in full resolution. Its very low power consumption makes it well suited for use in battery powered applications.